Inner cover blurb: 'Readers of A GARDEN OF SAND will not be surprised that the book is dedicated to Nelson Algren, for like Algren, Earl Thompson writes in rhythms and accents uniquely his own and, also like Algren, exposes the public to a level of American life generally closed to the pages of fiction. Thompson's world is that of the poor, semi-urban Middle West (and later the South), the world of people who run truck-stop cafés, work in oil-fields and shipyards, and live in cheap rooming houses and dubious hotels. They are people who die "in rented side-street rooms as stylelessly and miserably as they lived. A son in the Marines. A daughter who isn't speaking - like that." To them Earl Thompson has imparted the dignity born of desperation and a will to survive adversity that ultimately becomes a tribute to the human spirit. The story he tells will no doubt shock some and perhaps even offend others, containing as it does a rawness and candor incompatible with gentility. 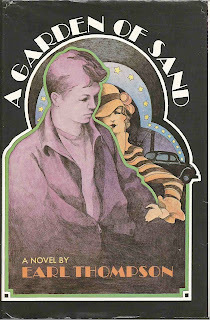 If its central theme is the formation of a young boy's obsessive sexuality, its even greater power lies in its depiction of people and places at a time when "girls who scorned bandeaux beneath their middy blouses hung a Wings on their lip, rolled their stockings below their knees and cocked a man's hat over one eye.... Their heroes were John Dillinger, Pretty Boy Floyd, the Barkers, Bonnie Parker and Clyde Barrow, Alvin Karpis and Homer Vanmeter." Just such a girl was Wilma MacDeramid, who got her ideas of class from the movies ("I'm no nickel and dime dollie. Gimme a fifty, you crumb, for the powder room") and her satisfactions wherever she could find them. Her father, John MacDeramid, was hybrid, part Populist, part Wobbly, and his own man. Her son Jacky was born out of wedlock. The happiness that each could seize lasted no longer than a night or a day, and it is Jakcy's frantic efforts to find warmth and love in a world of deprivation and casual brutality that provide the continuing thread of the narrative. Reading reveals: Not so much a lost book, it's been reprinted a few times over the years, it is however a somewhat neglected one, with US writer Thompson pretty much a non-figure on this side of the Atlantic. 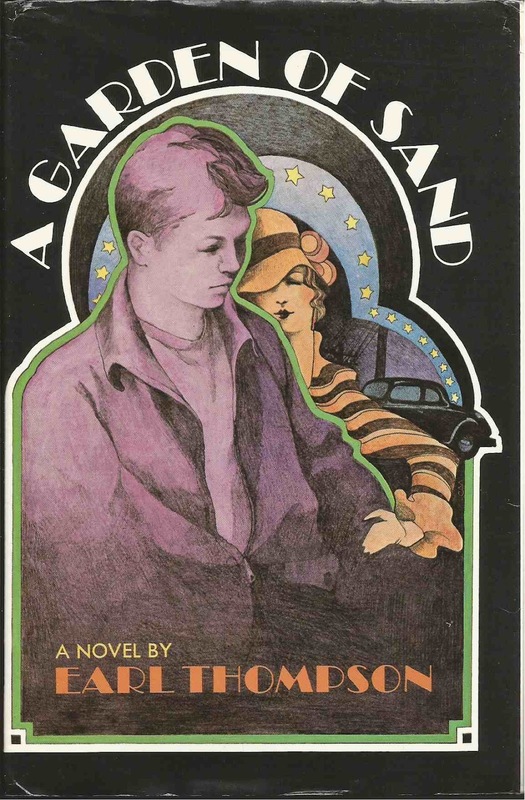 The first part of a trilogy, it explores the life of a sexually precocious young boy growing up during the Depression, sprawling out to include the exploits of his family along the way. When I watch a film featuring Sean Connery or Jeff Bridges or whoever playing a distinguished American author holed up in a university somewhere, working on a novel they've been hammering away at for years, this is exactly the sort of book I imagine them writing, with a broad historical and geographical sweep, and muscular imagery such as 'the glaring, heat-bleached denim sky'. This is a beautiful novel that takes you into a world and surrounds you with fantastic details and great characters and engrossing situations etcetera, etcetera, etcetera. More than this, though, it captures perfectly a sense of falling through the cracks, of the loss of integrity and dignity needed to survive when at the very bottom of a society in trouble. It really is quite frustrating to see A Garden of Sand languish, while something like Ironweed by William Kennedy is canonized, when the difference in quality between the two really isn't that great. In fact, I would go so far as to say I think you should read this book.